. :: Worldwide Spa Review Magazine ::. My pale Norwegian skin just got bolder. 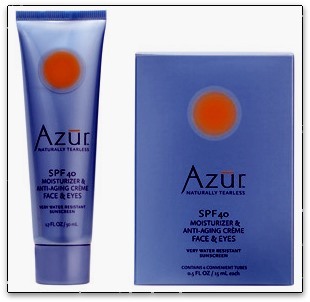 While I still believe in sun glasses and broad-brimmed hats, I won’t have to cringe at the thought of even the morning sun hitting my face anymore thanks to Azur sun products: protection with an SPF of 40. Azur wanted to create anti-aging protection for skin before sun trauma ever occurs. Azur’s Moisturizer and Anti-Aging Crème and their Face and Body Crème include zinc oxide and titanium oxide, ingredients they use to block ultra-violet rays. They combine their sunscreen with Vitamins A, C and E for antioxidant protection, and moisturizers like Aloe Vera – all said to be important in keeping skin young-looking. They are also PABA-free, and paraben-free. The company describes its products as “… a phenomenon in age-prevention. While most anti-aging creams are formulated to address existing skin damage, Azur actually works to prevent fine lines, wrinkles and discolorations before they occur.” It calls its products tearless, meaning they won’t sting or burn. The company says that, because they contain no chemicals to adversely affect the skin, these products can be applied across the face and close to the eyes, and that they will actually improve your skin’s youthful appearance. Most sun care products strong enough to keep me from burning are also too harsh for my sensitive skin. They tend to make my skin look red, traumatized and older than usual. I tried Azur’s Moisturizer and Anti-Aging Crème first and, after years of painful sunscreens, I was a bit gun-shy. I found the product thick but pleasant. A little was all I needed, but because the product is so thick it took a little gentle massaging to cover and penetrate. It was surprisingly cool and gentle on my delicate skin, especially for a strong sunscreen. Next I tried the Face and Body Crème. It took a little time to cover my skin, but it was worth it. Delicate places like the backs of my hands – a real anti-aging nightmare for most of us – was covered and never irritated. It was a treat to go outside with serious sun protection, but without my skin feeling raw and abused. At night, after I washed my face with my usual cleanser and dried it, my skin felt smoother than usual. Neither product washed away easily, so I’ll be able to take walks on summer mornings without fear that sweat will leave my shoulders and neck unprotected after the first hill. To place an order or to find out more information about Azur and its products, visit www.azurskin.com or call the company toll-free at (888) 698-3275.